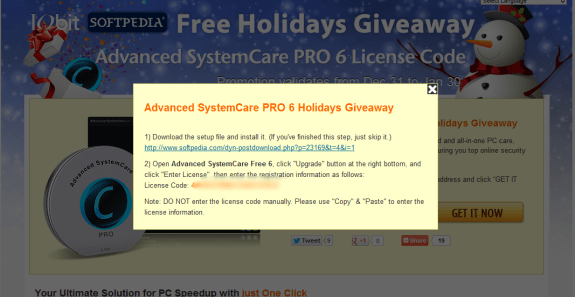 Iobit and Softpedia are teaming up with a giveaway forÂ Advanced SystemCare PRO 6 to celebrate the Holidays. Well Christmas and the New Year’s Day may have gone by, but we still get to enjoy this promo. Visit the Promo page . Enter your email id in the text box and click on Get It Now. A box should pop-up giving you a download link and the license code. Copy and paste the license code and save it on your computer. 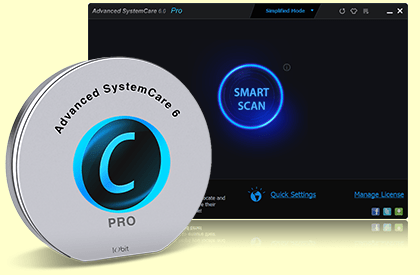 Download and install Advanced System Care Pro 6 from the link you got in the pop-up or you could get it from here. Open Advanced System Care and use the license code to register the software. Note: This promotion is valid from Dec 31 to Jan 30. Thanks to donotcrack for the info.